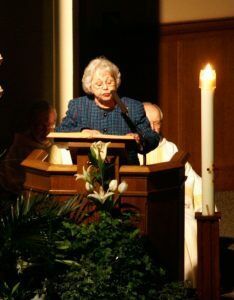 Liturgical Ministers are faithful parishioners who are willing to give of their time to enhance the most important part of our week or day, Mass. An Extraordinary Minister of Holy Communion is a reverent person to help in the distribution of the Eucharist at Masses. Duties include arriving ten minutes before Mass to confirm your presence and the responsibility of finding a replacement in the event you are unable to attend your assigned Mass. Time required: Training is required. You will be asked to serve at one Mass approximately every three weeks. In addition, Holy Days are scheduled. Sacristans make all the preparations necessary before each Mass. Time required: Please arrive twenty minutes before Mass once every three weeks. Greeters are friendly faces necessary to create a welcoming atmosphere for those entering our church. They are hosts and hostesses for the Lord’s House and the Lord’s Meal. Time Required: Please arrive about 20 minutes before Mass. 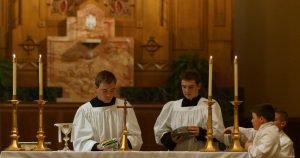 Conscientious servers assist at Liturgies. Duties include leading the procession before Mass, assisting the priest during Mass, and putting things back in order after Mass. Boys and girls in fourth grade through young adulthood may be servers after attending a training session. If unable to serve at your assigned Mass, you must find a replacement. Time required: There will be training sessions plus servers are expected to be ready for Mass fifteen minutes before Mass. Ushers seat worshipers as needed, distribute Sunday Bulletins, care for any need that might occur, and straighten pews after Mass. Time required: Please arrive about twenty minutes before and stay a few minutes after Mass. Training will be provided. During the Creed designated men and women gather in the back of church to take up the collection at the direction of the ushers. In order to proclaim the Good News, it is necessary to prepare and try to better understand the meaning of the Scripture to be read. 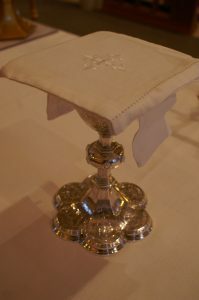 To ensure the best presentation, additional materials are given to lectors and they are expected to prepare before they read Scripture passages at Mass. Time required: Lectors are scheduled on a rotating basis, usually once every four to five weeks. If unable to serve at your assigned Mass, you must find a replacement. Gift bearers present the bread and wine, the prayer intention book and the basket of money offering to the priest at the Preparation of the Gifts. You may want to sign up if the Mass is for a deceased family member or any special occasion. Contact: Sign the book in the back of church or check with the usher before Mass.